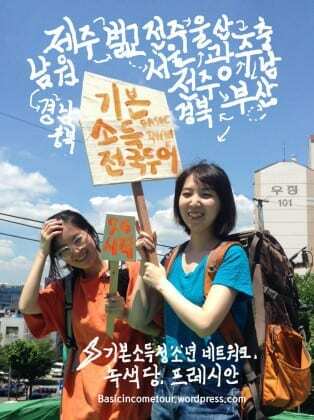 The Basic Income Youth Network and Green Party in Korea will start “Basic Income Nationwide Tour” on July 6th. Tour continues for 2 weeks, departing from Jeju Island and visiting Jeolla-do, Gyeongsang-do, Chungcheong-do regions of Korea. This tour is aiming to introduce basic income to people all over the country and collect various opinions about basic income from different people of ages and regions. In March, the Korean Green Party adopted basic income in their party platform. And in June the city of Seoungnam-si announced that it is considering optional basic income, ‘youth income’, as a new policy. Under these circumstances, the tour will help develop a Korean form of basic income and could be the cue for nationwide networking about basic income. The tour contains various programs such as street campaigns, basic income movie screenings, conferences, open lectures, interviews and so on. Results will be published on the official blog and Internet media Pressian. For more information see the following websites.